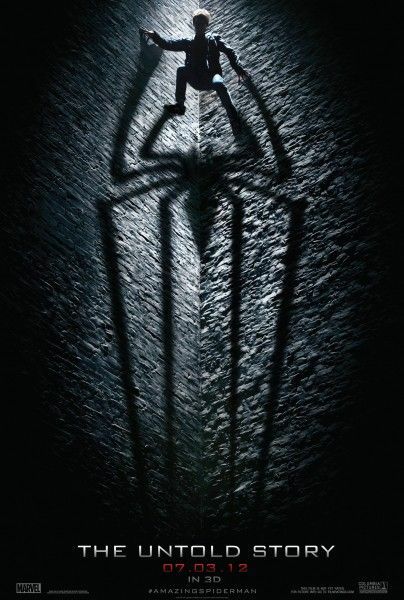 Last night, Sony Pictures released a new trailer for The Amazing Spider-Man. We should no longer trust trailers to be just trailers. New policy: when it comes to blockbuster movies, watch the trailer in HD and then go through frame-by-frame for a hint of a viral campaign. That may sound crazy, but that’s what you had to do if you wanted to catch the beginning of the viral campaign for The Amazing Spider-Man. Hit the jump for more. The Amazing Spider-Man opens in 3D on July 3rd. For more Spider-Man coverage: the new trailer, over 25 new images, our recap from the footage shown at the Spider-Man preview event, and a gallery of all the images released thus far. Near the end of the new trailer, you can make out the faint words “Mark of the Spider-Man”. If you go to the address “markofthespider-man.com“, you’ll hit a website with the Amazing Spider-Man spider-logo and six screens filled with static. There may be a way to proceed from there, but I’m no good at viral campaigns so I don’t know. Maybe there’s a way to go forward, or maybe we just have to keep an eye on this site until something happens. Either way, there’s a viral campaign going down for The Amazing Spider-Man so it may be time to start paying attention to your spider-sense.